When you invest, you have to be prepared for risks. Every investment comes with risk. However, that doesn’t mean that you should ignore risks and invest anyway. It’s important to understand what is too risky for you, and what you can do to mitigate your risks while still earning an acceptable return. First of all, it’s important to understand your risk tolerance. You need to take a look at your financial situation, your life situation, and other factors. 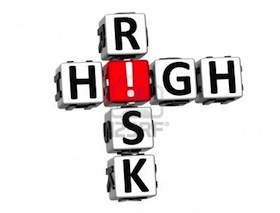 Can you handle a riskier asset allocation? What are your goals now and for the future? Take a look at where you are at, and where you want to be. Think about what you can afford to lose — and what you can’t. It’s important to invest if you want to get ahead, but you don’t want to get in over your head. Get a clear idea of your risk tolerance right now. If you aren’t sure about how to figure your risk tolerance, consider consulting with a financial professional. A reputable, fee-based financial professional can help you create a risk profile that you can use as a guide as you choose assets for your portfolio. A loss will financially impact you: How much of an impact will you experience from a loss? Are you stretching your finances to make your investment? It’s one thing to set aside $400 a month in an index fund. If you can afford that $400 a month, you will probably be ok long term. However, if you are stretching to scrape together $1,000 for an “opportunity,” you could be in trouble. What happens if it doesn’t pay out and you lose that $1,000? How would your finances be impacted? The asset’s volatility is very high: Do you find yourself checking for daily updates on your investment? Does that asset’s price shift around a lot? If you look at the history of the asset, is there a lot of very wide price swings? If that is the case, and you worry about the volatility, the investment is probably to risky for you. Some investors can handle the price swings. They have enough money to handle the losses, and they don’t panic at wide swings in price. If you aren’t like this, stay away from the investment. You need stable income: At some point in your financial lifecycle, you will need stable income. As you approach retirement, some investments are too risky. You might lose capital that you need to sustain your income during retirement. This is more of a life situation factor than anything else. If you need a stable income, and the investment can’t offer that, you might be looking at something too risky for you at this stage in your life. You have to borrow to make it work: Many investors find great success by investing on margin. Basically, they borrow money and make a big play, hoping that it will pay off enough to overcome the interest charges. If you have to borrow to make it work, though, the investment might be too risky for you — especially if you can’t afford the outcome if you lose. Just as gains are magnified when you invest on margin, the losses are magnified as well. If you don’t have the assets to deal with that kind of loss, a margin investment is too risky for you. For most investors, it’s more about creating a long-term plan that relies on consistency. If you invest in an index fund regularly over the course of 30 years, you are likely to come out ahead. The index fund reduces your exposure to volatility and risk, while still providing a reasonable return over time. Dollar cost averaging is a great strategy for many investors, and it can help ensure that you build your nest egg over time without getting in too deep with risk. Before you decide to invest, make sure you understand the amount of risk you can handle, and make a plan for getting in too deep.